I bought this when I was in New York at the Barnes & Noble in Union Square. Did I mention it's a HUGE bookstore. I could have spent thousands in there! I've mentioned many times before that I found it really hard to get in to these books at first, but that after about number three I really started to enjoy them.Well, I think this is def one of the better ones. While they don't set the world on fire for their literary prowess they are a really good easy read, that keep you interested from start to finish. Plus Eric is hot! Even in written form! Even with the blood of two vampires in her system, Sookie is having trouble healing from the terrible torture she endured at the hands of her great-grandfather's enemies during the brief but deadly Fae War. Worse are the emotional wounds - over the loss of (this bit edited out for anyone who hasn't read book 9 yet but wants to!) - and the near death of her first love...Sookie is hurt and she is mad. Just about the only bright spot in her life - besides the fact that she is, after all, still alive - is the love she thinks she feels for vampire Eric Northman, who is under scrutiny by the new vampire king because of their relationship...As the political implications of the shifters' coming-out are beginning to be felt, Sookie's connection to one particular Were draws her into the dangerous debate. And, unknown to her, though the doors to Faery have been closed, there are still some fae on the human side - and one of them is angry at Sookie. Very, very angry. I really enjoyed this book in the series because there wasn't too much going on and it didn't try to yet again raise the stakes (pardon the pun) in the action department. For a while there it seemed that each book was trying to top the one before in what was going on (not there's anything wrong with that, but I was wondering how she could follow up the Fae War) but this books settled back nicely, it managed to build on a few of the characters history, in particular Eric's, and it was good to see that development. 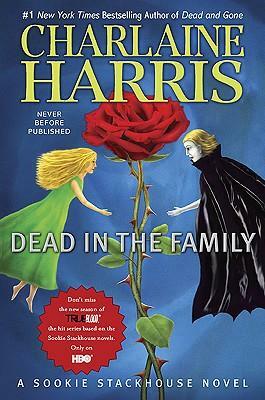 If you enjoy the Sookie Stackhouse series you should like this latest one. I just finished this book last week and found it to be one of the better ones. I started by watching the HBO series "True Blood" then started picking up the books. I read them out of order (as my local library had them available). I now have the series to read in order, but there are so many other books to read!! I did like this one better than some of the others. And Eric is great is this form. Although I picture the actor and it makes it so much better. Could you advise the title of the 9th book in the series. I have the first 8, but not sure which one is the 9th. @Heather- Yeah, I def liked this one better than a few of them and yes indeed, Eric is great! @DaniV- The 9th book is called Dead and Gone.